Milk production is on the rise according to the latest report from USDA’s National Agricultural Statistics Service. 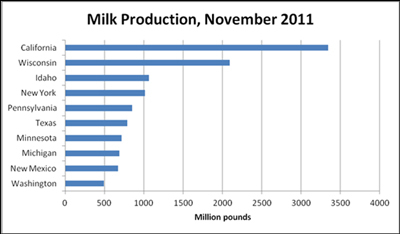 Milk production in the 23 major States during November totaled 14.7 billion pounds, up 2.2 percent from November 2010. October revised production at 15.2 billion pounds, was up 2.5 percent from October 2010. The report indicates that production increases came from both a per cow production increase of 16 pounds and a herd expansion of 108,000 head since this time in 2010. Notably, California continues to lead the nation in milk production outpacing second place Wisconsin by more than 1.2 billion pounds last month. As the U.S. dairy industry is a major market for feed corn, distillers dried grains and corn silage, the National Corn Growers Association noted that this trend benefits not only dairy but also grain farmers across the country. Enter your email address and receive notifications of new posts by email. AgWired – Where in the World? 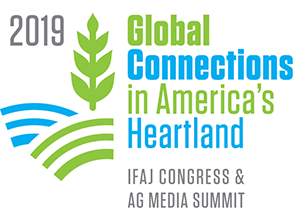 - National Agri-Marketing Association Convention - Kansas City, MO - April 15-17. - Chicken Media Summit - Cambridge, MD - April 19-21 - Coverage sponsored by National Chicken Council. - Alltech Rebelation - Lexington, KY - May 16-20 - Coverage sponsored by Alltech. AgWired is one of the very first agricultural information blogs and has a focus on marketing. Our information is open and free to everyone in the industry. Besides the weekly ZimmCast we frequently publish press conferences and interviews with industry leaders in all segments of agriculture. Welcome to AgWired's home for the latest information and resources on the animal agriculture sector. We've brought World Dairy Diary "in-house" and expanded our coverage to include all animal agriculture - beef, dairy, poultry, swine and more. Contact us about covering your next event!